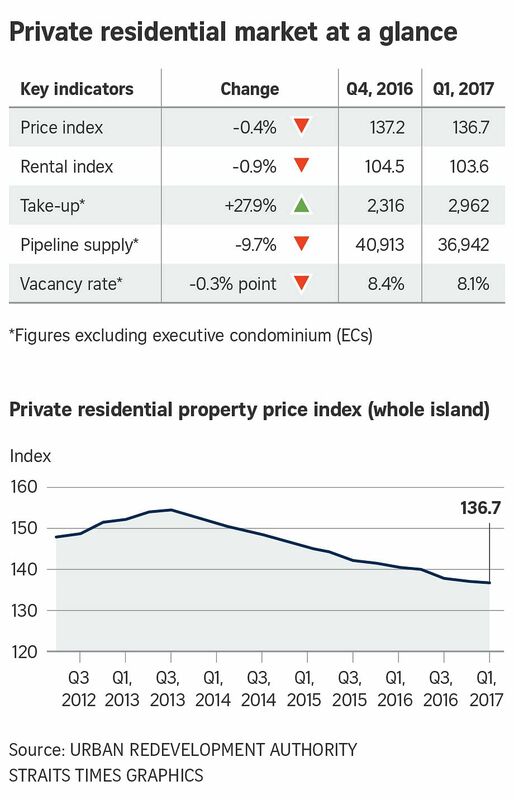 SINGAPORE - Private home prices in Singapore continued to fall in the first quarter, marking a 14th consecutive quarter losing streak, according to data from the Urban Redevelopment Authority (URA) on Friday (April 28). Overall values dipped by 0.4 per cent in the first quarter from the last three months of 2016, compared to the 0.5 per cent decline from the third to the fourth quarter. The URA figures showed that prices of non-landed private homes was unchanged in the first quarter, following a 0.8 per cent decline in the previous quarter. Prices fell only in the core central region where values dipped by 0.4 per cent. Condos in the city fringe saw a price increase of 0.3 per cent, while values inched up by 0.1 per cent in the suburban areas. Rentals of private residential properties also continued to weaken, slipping 0.9 per cent in the first quarter, after posting a 1 per cent decline from the third to the fourth quarter of 2016. The vacancy rate of completed private homes, excluding executive condos (ECs), was 8.1 per cent at the end of March 31, down from 8.4 per cent in the previous quarter. Developers sold 2,962 private homes, not counting ECs, in the first quarter - higher than the 2,316 shifted in the fourth quarter. The URA noted that 18,870 uncompleted homes remained unsold as at the end of the first quarter - comprising 15,930 private apartments and 2,940 ECs. Prices of landed homes, meanwhile, fell 1.8 per cent in the first quarter, compared with the 0.8 per cent growth recorded in the previous quarter.